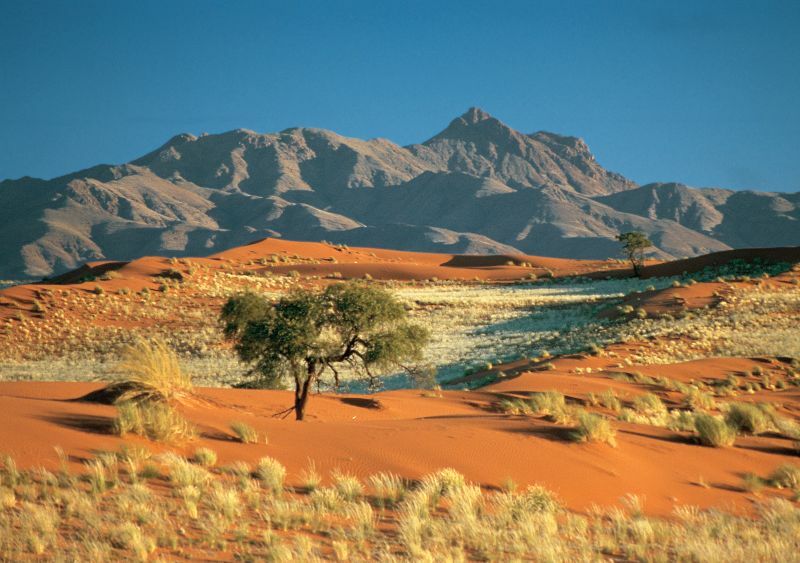 Namibia is a country of extraordinary scenery and endless vistas. 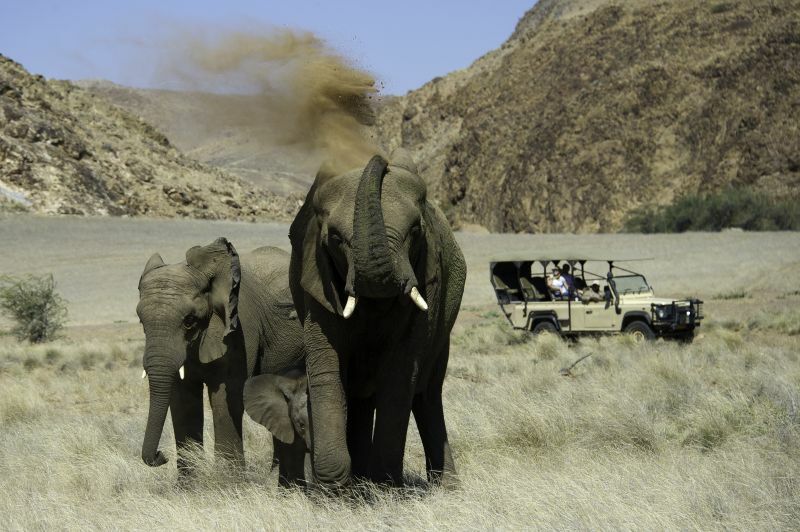 This 12-day safari offers the ‘Best of Namibia’. Travel with one of Namibia’s most reputable and well-known naturalist guides, climb some of the world’s highest free-standing sand dunes, sea kayak with seals and dolphins, track for desert-adapted elephants, visit the UNESCO World Heritage Site at Twyfelfontein, visit an authentic and remote Himba settlement, experience memorable and exciting guided game drives, and visit the world renowned AfriCat Foundation and learn more about conservation initiatives involving Africa’s large cats. This unforgettable trip affords you the chance to experience this magnificent and memorable country in a very personal way. Rest up, and get ready for your Ultimate Namibia Safari! Your driver will meet you at the Windhoek International Airport and transfer you to your hotel. Relax and settle in. In the evening, enjoy dinner in the comfort of your hotel. This morning we will collect you from your hotel in your safari vehicle with your private guide and drive southwest through the scenic Khomas Hochland highlands before heading down the Great Escarpment into the Namib Desert below, stopping for a picnic lunch at a scenic location along the way. You arrive at Sossus Dune Lodge in the mid-afternoon and you will stay here for two nights whilst you explore the remarkable sights of the Namib Desert with your guide. If there is still time today, your guide will take you to visit Sesriem Canyon, a nearby geological attraction, or explore Elim Dune. However, if you prefer, you can just relax and soak in the scenic and tranquil surroundings at Sossus Dune Lodge. Sesriem Canyon: Sesriem Canyon has evolved through centuries of erosion by the Tsauchab River which has incised a narrow gorge about 1.5 km long and 30 meters deep into the surrounding conglomerates, exposing the varying layers of sedimentation deposited over millions of years. The shaded cool depths of the canyon allow pools of water to gather during the rainy season and remain for much of the year round. These pools were a vital source of water for early settlers who drew water for their livestock by knotting six (ses) lengths of rawhide thongs (riems) together, hence the canyon and surrounding area became known as Sesriem. Sossus Dune Lodge: Situated within the Namib Naukluft Park, close to the Sesriem Canyon, and providing sweeping vistas of the dunes to the west, guests benefit from being able to reach Sossusvlei before sunrise, or to stay until after sunset. Sossus Dune Lodge offers a good base from which to go on guided excursions to Sossusvlei, Sesriem and the surrounding areas, as well as sunset drives and guided walks, to fully unleash the beauty and biological diversity of the desert environment. 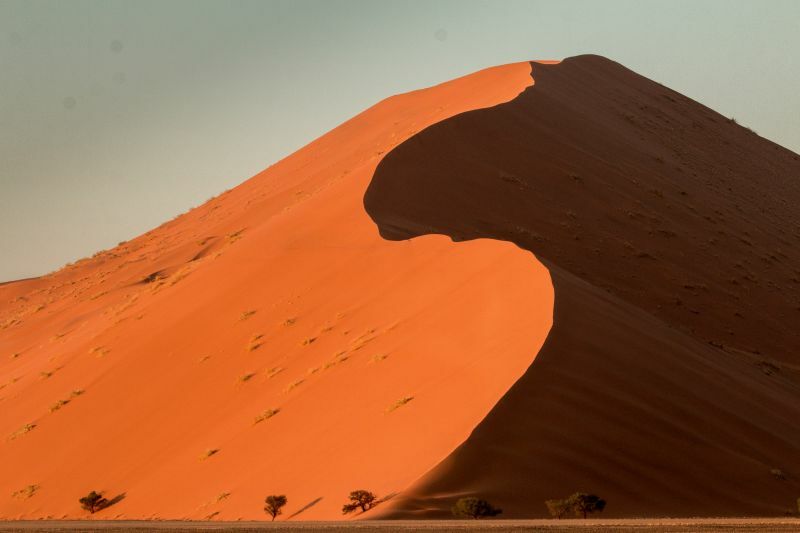 This morning you will need to rise early for a magical excursion with your guide in the Namib Naukluft National Park, normally setting off before sunrise to capture the dunes whilst the light is soft and shadows accentuate the towering shapes and curves. This area boasts some of the highest free-standing sand dunes in the world and your guide will give you an insight on the formation of the Namib Desert and its myriad of fascinating creatures and plants that have adapted to survive these harsh environs. Once you have explored Sossusvlei, Deadvlei and surrounding dune fields to your heart’s content you can enjoy a relaxed picnic brunch in the shade of a camel thorn tree. You then return to Sossus Dune Lodge in the early afternoon in time for a late lunch, with the option to visit Sesriem Canyon afterwards if you haven’t already done so the day before. The rest of the afternoon is at your leisure (from experience, this is usually welcomed after an exhilarating morning in the dunes). Sossusvlei: This most frequently visited section of the massive 50,000 km² Namib Naukluft National Park has become known as Sossusvlei, famous for its towering apricot coloured sand dunes which can be reached by following the Tsauchab River valley. Sossusvlei itself is actually a clay pan set amidst these star shaped dunes which stand up to 300 meters above the surrounding plains, ranking them among the tallest dunes on earth. The deathly white clay pan contrasts against the orange sands and forms the endpoint of the ephemeral Tsauchab River, within the interior of the Great Sand Sea. The river course rises south of the Naukluft Mountains in the Great Escarpment. It penetrates the sand sea for some 55 km before it finally peters out at Sossusvlei, about the same distance from the Atlantic Ocean. Until the encroaching dunes blocked its course around 60,000 years ago, the Tsauchab River once reached the sea; as ephemeral rivers still do in the northern half of the Namib. Sand-locked pans to the west show where the river previously flowed to before dunes shifted its endpoint to where it currently gathers at Sossusvlei. Roughly once a decade rainfall over the catchment area is sufficient to bring the river down in flood and fill the pan. On such occasions the mirror images of dunes and camel thorn trees around the pan are reflected in the water. Sossusvlei is the biggest of four pans in the vicinity. Another, famous for its gnarled and ghostly camel thorn trees, is Deadvlei which can be reached on foot over 1 km of sand. Deadvlei’s striking camel thorn trees, dead for want of water, still stand erect as they once grew. They survived until about 900 years ago when the sand sea finally blocked the river from occasionally flooding the pan. NOTE: Option to include a sunrise balloon flight or scenic light aircraft flight over the Namib Naukluft National Park before you depart for Swakopmund (optional extra at additional cost). The fascinating drive today takes you northwest through awesome and ever changing desert landscapes of the Namib Naukluft National Park, including the impressive Gaub and Kuiseb canyons. You will meet the coast at the port town of Walvis Bay and then continue north to Swakopmund where you can enjoy the pleasant seaside location and cooler coastal air for your next two nights. There will be time this afternoon to explore the town and wander along the waterfront on foot, before heading off for dinner at a popular restaurant which specializes in fresh seafood. 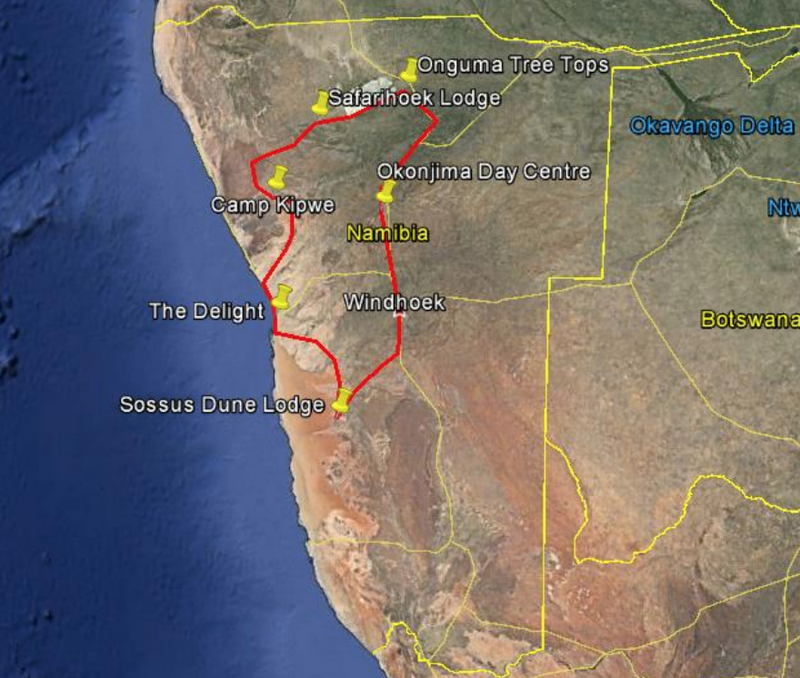 NOTE: As an alternative to the drive from Sossus Dune Lodge to Swakopmund you may like to take a scenic light aircraft flight over Sossusvlei and along the Diamond Coast (optional extra at additional cost), allowing you a bird’s eye view over the dune sea, abandoned mining camps, shipwrecks, Sandwich Harbour and salt pans before you land at Swakopmund Airport. Your guide will drive to meet up with you in Swakopmund later in the day. Swakopmund: Swakopmund resembles a small, German coastal resort nestled between the desert and the sea. It boasts a charming combination of German colonial architecture blended with modern hotels, shops, restaurants, museums, craft centres, galleries and cafés. Swakopmund had its beginnings as a landing station in 1892 when the German Imperial Navy erected beacons on the site. Settlers followed and made attempts to create a harbour town by constructing a concrete Mole and then an iron jetty – which attempts were ultimately unsuccessful. The advent of World War one halted developments, and the town sank into decline until half a century later when infrastructure improved and an asphalt road opened between Windhoek and Swakopmund. This made reaching the previously isolated town quicker and easier and it prospered once again to become Namibia’s premier resort town. Although the sea is normally cold for swimming there are pleasant beaches and the cooler climate is refreshing after time spent in the desert. Get close to the wildlife on a kayaking excursion – See Cape fur seals, Heaviside and bottlenose dolphins, pelicans, flamingos and a wide variety of other sea birds. After an early breakfast your guide will drive you along the scenic coastal road back south to Walvis Bay for a memorable kayaking adventure within the outer lagoon. After meeting your kayaking guide you will be taken on a short scenic drive to Pelican Point to see its lighthouse and windswept beauty, stopping briefly at the salt works to view the variety of birdlife on your way to the launch point. The kayaking is an ideal way of seeing Cape fur seals, Heaviside and bottlenose dolphins, pelicans, flamingos and a wide variety of other sea birds. If you are lucky, there is also a chance of seeing whales, leatherback turtles and sunfish. During the course of the day the guide will stop and inform you about the environment and light refreshments will be served on the beach before heading back to Walvis Bay. You also have the choice to partake in a memorable motorized boat seal and dolphin excursion within the outer lagoon and harbour should the kayaking not appeal. Here you should also see Cape fur seals, heaviside and bottlenose dolphins, pelicans, flamingos and a wide variety of other sea birds. Again, if luck is on your side, there is also a chance of seeing whales, leatherback turtles and sunfish. During the course of the excursion snacks will be served along with local sparkling wine and fresh oysters, before you will return to the jetty at roughly midday. 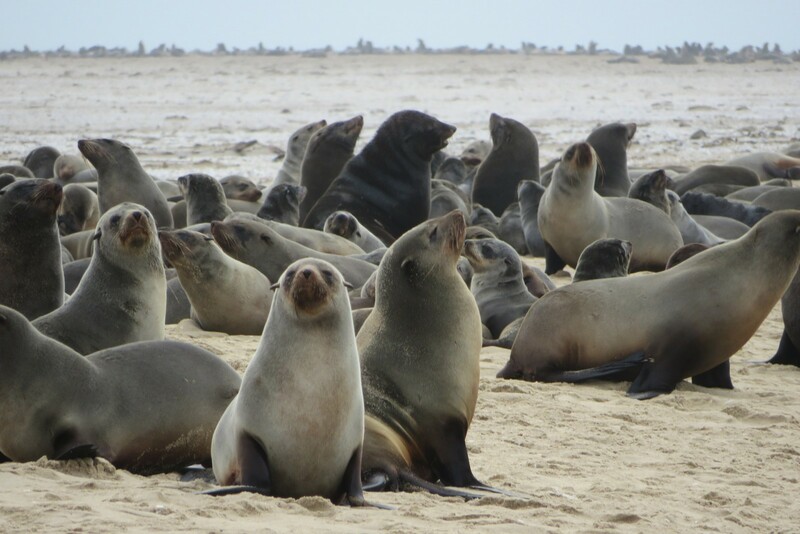 You then have the opportunity to explore the waterfront area of Walvis Bay further before returning to Swakopmund for an afternoon at leisure at your guesthouse or out in town. Activities such as camel rides, scenic flights, sandboarding and more can all be booked at an extra cost. Continuing on your safari today, the road takes you north and east into the wonderful and diverse region of Damaraland. You pass Namibia’s highest mountain, the Brandberg which peaks at 2,573 m above sea level, and take time to view game and absorb the vastness of the scenery along the way. Damaraland is typified by displays of colour, magnificent table topped mountains, rock formations and bizarre-looking vegetation. 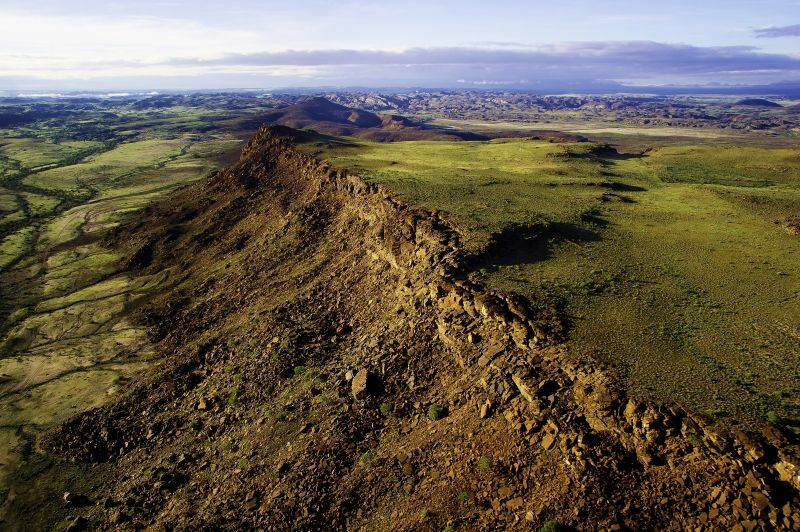 The present day landscape has been formed by the erosion of wind, water and geological forces which have formed rolling hills, dunes, gravel plains and ancient river terraces. It is the variety and loneliness of the area as well as the scenic splendour which will reward and astound you, giving one an authentic understanding of the word ‘wilderness’. If time allows this afternoon your guide will take you to visit the nearby attractions and geological sites of the pre-historic Twyfelfontein rock engravings (a UNESCO World Heritage Site) – if not there is plenty of time to see them tomorrow. Twyfelfontein: Strewn over a hillside amongst flat-topped mountains of red sandstone, Twyfelfontein’s boulders and slabs of red sandstone hold some 2,500 prehistoric engravings that depict wildlife, animal spoor and abstract motifs. It is perhaps the largest and finest collection of petroglyphs in Africa. The engravings show animals such as elephant, giraffe, kudu, lion, rhinoceros, springbok, zebra and ostrich that once used to drink from a fountain at the bottom of the hill. In some cases footprints were engraved instead of hooves or paws. The abstract motifs feature mainly circles. Stone tools and other artifacts found at Twyfelfontein suggest that hunter-gatherers occupied the site over a period of perhaps 7,000 years. These days a local guide accompanies visitors to showcase the rock art. The engravings lie along two circular routes, one an hour’s climb and the other 40 minutes longer. Twyfelfontein is one of Namibia’s key National Monuments and is a UNESCO World Heritage Site. Camp Kipwe: Camp Kipwe lies in the heart of Damaraland, ideally located a short drive from the local attractions in the area. The Camp is nestled amongst an outcrop of giant granite boulders, a stone’s throw away from the ephemeral Aba Huab riverbed where desert adapted elephants often traverse. After an early breakfast you will be treated to an exciting 4×4 excursion along the ephemeral Aba Huab and Huab River valleys to explore this remarkable region and to search for game, including the elusive desert adapted elephants if they are in the area. Damaraland is home to a variety of desert adapted wildlife and hidden desert treasures. As the elephants are mostly active in the mornings you will normally have the best chance to see them then before returning to camp for lunch. However, if all the safari participants agree, you also have the option to take a picnic lunch and stop to enjoy that in the shade of a large Ana tree by the riverbed, ideally while watching a herd of elephant browsing nearby. Your guide will arrange to fit in a visit to Twyfelfontein and other nearby attractions at a suitable time if you haven’t already done so the previous day. On return to camp there should be time to take a walk into the local area with your guide if desired, or simply relax and enjoy some well-deserved leisure time. Desert Adapted Elephant: In habitats with sufficient vegetation and water an adult elephant consumes as much as 300 kg of roughage and 230 litres of water every day of its life. Consider what a herd of them would eat and drink in a week or a month or a year. Finding an African elephant in a desert? Well, yes and not only elephant, but other large mammals as well, such as black rhinoceros and giraffe. Their ranges extend from river catchments in northern Kaokoveld as far south as the northern Namib. Apart from the Kunene River, seven river courses northwards from the Ugab provide them with possible routes across the desert, right to the Skeleton Coast. The biggest are the Hoarusib, the Hoanib, the Huab and the Ugab Rivers. Desert adapted elephant in Kaokoland and the Namib walk further for water and fodder than any other elephant in Africa. The distances between waterholes and feeding grounds can be as great as 68 km. The typical home range of a family herd is larger than 2,000 km², or eight times as big as ranges in central Africa where rainfall is much higher. They walk and feed at night and rest during the day. To meet their nutritional and bulk requirements they browse on no fewer than 74 of the 103 plant species that grow in their range. Not a separate species or even a subspecies, they are an ecotype unique to Namibia in Africa south of the equator, behaviourally adapted to hyper-arid conditions. Elephant in Mali on the southwestern fringe of the Sahara Desert are the only others known to survive in similar conditions. Today after a very early breakfast you set off on your journey to the Etosha National Park, travelling via the scenic Grootberg Pass. Along the way your guide will take you to visit a local Himba settlement – you may have to search for a while as the semi-nomadic Himba people sometimes move location with no notice. They are one of the last truly traditional peoples of Namibia and have little time for conventional practices. Here you will learn about the customs and traditions of this very proud nation, and will be given insight into their beliefs, way of life and everyday routine. Depending on the school semester and school holidays, you may also visit the Grootberg Primary School, a rural school where. After visiting the Himba and school you will head east through the small town of Kamanjab before heading on towards tonight’s destination at the new Safarihoek Lodge, which is situated on the south western border of the Etosha National Park. A picnic lunch will be enjoyed en-route and arrival will be in the very late afternoon or early evening (after a long but rewarding day). After your arrival you will have some time at leisure, which can be spent appreciating the unique surroundings and enjoying the game viewing at the camp’s floodlit waterhole and enjoy a different vantage point from the camps underground and elevated hides. 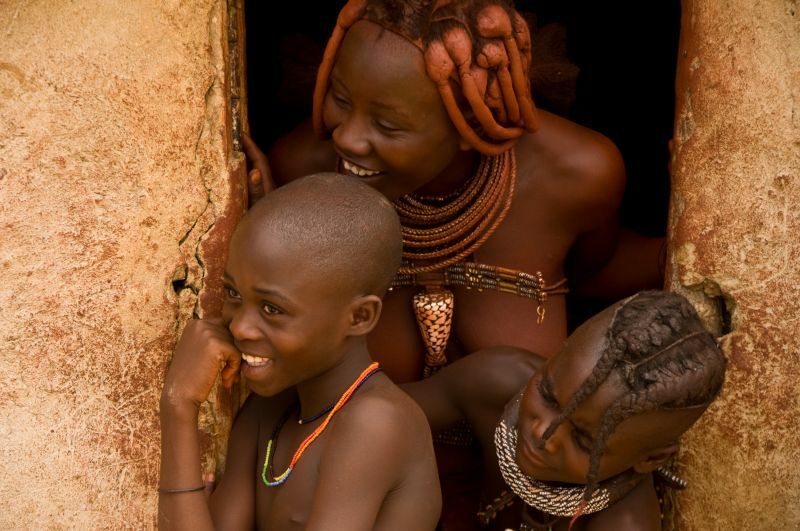 The Himba: The Himba, Tjimba and other Herero people who inhabit Namibia’s remote north-western Kunene Region are loosely referred to as the Kaokovelders. Basically Herero in terms of origin, language and culture, they are semi-nomadic pastoralists who tend to tend from one watering place to another. They seldom leave their home areas and maintain, even in their own, on which other cultures have made little impression. For many centuries they have lived a relatively isolated existence and were not involved to any noteworthy extent in the long struggle for pasturelands between the Nama and the Herero. The largest group of Kaokovelders is the Himba, semi-nomads who live in scattered settlements throughout the Kunene Region. They are a tall, slender and statuesque people, characterized especially by their proud yet friendly bearing. The women especially are noted for their unusual sculptural beauty, enhanced by intricate hairstyles and traditional adornments. They rub their bodies with red ochre and fat, a treatment that protects their skins against the harsh desert climate. The homes of the Himba of Kaokoland are simple, cone-shaped structures of saplings, bound together with palm leaves and plastered with mud and dung. The men build the structures, while the women mix the clay and do the plastering. A fire burns in the headman’s hut day and night, to keep away insects and provide light and heating. A family may move from one home to another several times a year to seek grazing for their goats and cattle. A Himba woman spends as much as three hours a day on her toilette. First she bathes, then she anoints herself with her own individually prepared mixture which not only protects her skin from the harsh desert sun, but also keeps insects away and prevents her body hair from falling out. She uses another mixture of butter fat, fresh herbs and black coals to rub on her hair, and ‘steams’ her clothes regularly over the permanent fire. Men, women and children adorn themselves with necklaces, bracelets, anklets and belts made from iron and shell beads. With their unusual and striking designs, these items have gained a commercial value and are being produced on a small scale for the urban market. Sculptural headrests in particular are sought-after items. Safarihoek Lodge is located on Etosha Heights and is part of a 60,000ha privately owned game reserve which shares borders, for about 65kms, with Etosha National Park. It consists of 9 farms that were originally used for domestic farming. Over a period of time, acquired and combined to create a stunning wildlife reserve that they are now privileged to be part of. With an array of animals which include various species of antelope, predators, birds as well as others. Etosha Heights Namibia partakes in various conservation efforts and projects that are currently operational and many more still to come. The main goal and vision is to encourage and develop sustainable eco-friendly tourism, all to the benefit of the area, animals as well as the community. 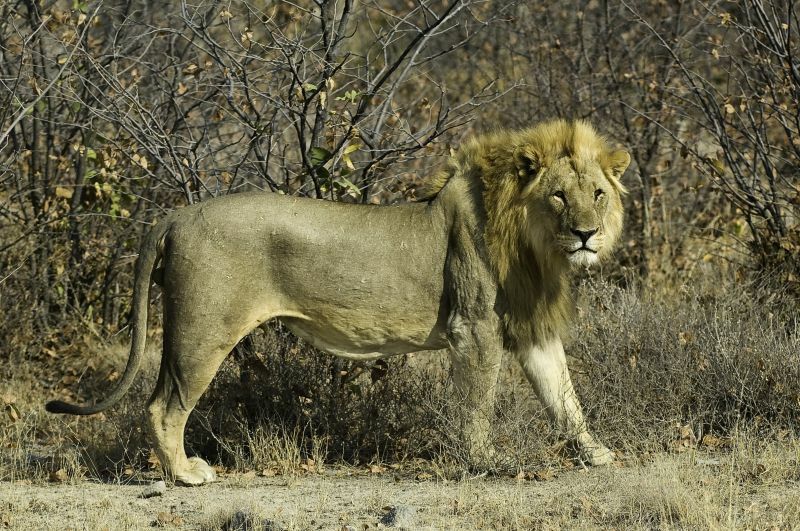 Today is dedicated to a full day of exciting game viewing within the central section of Etosha National Park from your private safari vehicle as you make your way from the southern Andersson’s Gate to Halali (where you may stop for lunch) and then on across via selected waterholes such as Goas, which are normally particularly good for game viewing, to Namutoni Camp in the east. You will have to leave the Park before sunset and head out to stay at the delightful Onguma Tree Top Camp with enough time to relax and freshen up before for dinner. The rest of the evening can be spent game viewing at the camp’s floodlit waterhole where game comes and goes throughout the day and night. Etosha National Park: Etosha National Park covers 22,270 km², of which approximately 5,000 km² is made up of saline depressions or ‘pans’. The largest of these pans, the Etosha Pan, can be classified as a saline desert in its own right. The Etosha Pan lies in the Owambo Basin, on the north-western edge of the Namibian Kalahari Desert. Until three million years ago it formed part of huge, shallow lake that was reduced to a complex of salt pans when the major river that fed it, the Kunene, changed course and began to flow to the Atlantic instead. If the lake existed today, it would be the third largest in the world. Etosha is the largest of the pans at 4,760 km² in extent. It is nowadays filled with water only when sufficient rain falls to the north in Angola, inducing floods to flow southward along the Cuvelai drainage system. The Park consists of grassland, woodland and savannah. 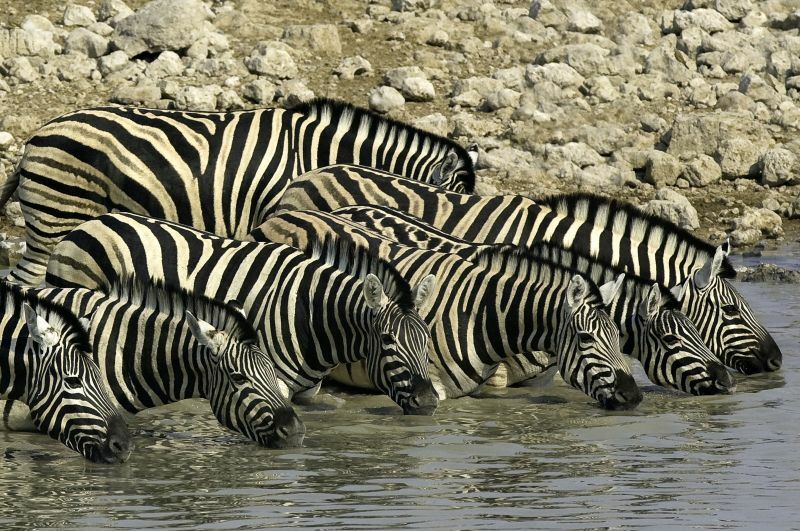 Game-viewing centers around the numerous springs and waterholes where several different species can often be seen at one time. The Park boasts some 114 mammal and over 340 bird species. Wildlife that one might see includes elephant, lion, giraffe, blue wildebeest, eland, kudu, gemsbok (oryx), zebra, rhino, cheetah, leopard, hyena, honey badger and warthog, as well as the endemic black faced impala. Onguma Tree Top Camp: Tree Top is a unique and beautiful camp, situated on the private Onguma Game Reserve, bordering on the eastern side of Etosha National Park. It is a small and intimate camp, especially designed for those travellers who would like to truly experience the bush in all its raw splendour. This camp is built on wooden stilts amongst the tree tops with full views over one of the most beautiful watering holes on the Reserve. The Boma area steps off from the lounge deck, where guests can relax while watching the animals and birds that frequent the hole throughout the day. The thatched rooms are designed in such a way that the canvas sides can be opened to expose breath-taking view and animals at any time. Another morning dedicated to memorable game drives within the eastern section of Etosha National Park with your guide. You return to camp for lunch and an early afternoon rest, spending your final afternoon on a game drive on the private Onguma Game Reserve, culminating in a sundowner overlooking Fischer’s Pan. You then return after sunset with enough time to freshen up and enjoy your final ‘safari dinner’ overlooking the camp’s floodlit waterhole. Onguma Game Reserve: Situated on the eastern side of Etosha National Park and bordering Fisher’s Pan, Onguma Game Reserve has more than 20,000 hectare of protected land and wildlife. The nature reserve boasts over thirty different animal species consisting of plains game such as kudu, giraffe, eland, oryx, hartebeest, zebra, impala and many more roam freely, as well as predators such as lion, cheetah and leopard, being common residents of the area. Onguma Game Reserve is now proud to be home to a family of black rhinos! More than 300 bird species can also be viewed at Onguma Game Reserve. Your early departure will take you south from Onguma Tree Top via Tsumeb, Otavi and Otjiwarongo to reach Okonjima’s AfriCat Day Centre, a wonderful highlight with which to conclude your safari. 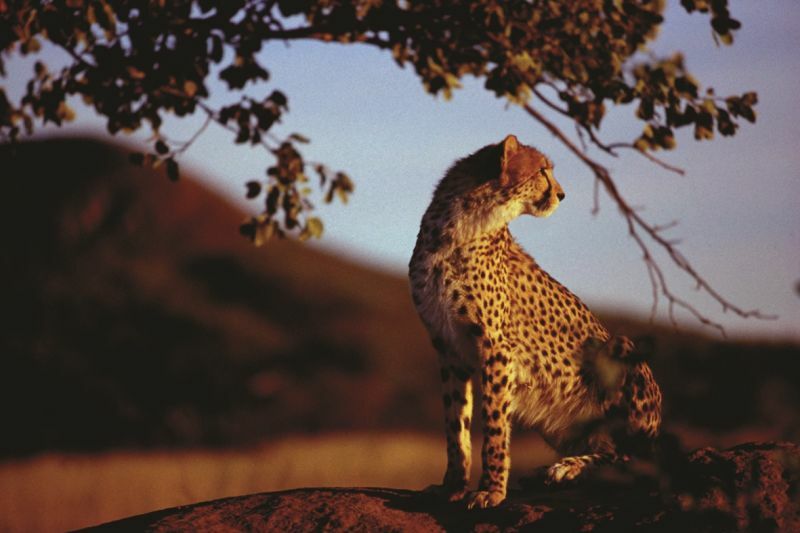 Okonjima is home to the AfriCat Foundation, a wildlife sanctuary which focuses on the research and rehabilitation of Africa’s big cats, especially injured or captured leopard and cheetah. You arrive in time for lunch before embarking on an exciting and informative game drive and tour of the centre. Here you will learn about the function and vision of the AfriCat Foundation and will also get to meet some of the Foundation’s special captive carnivore ambassadors. 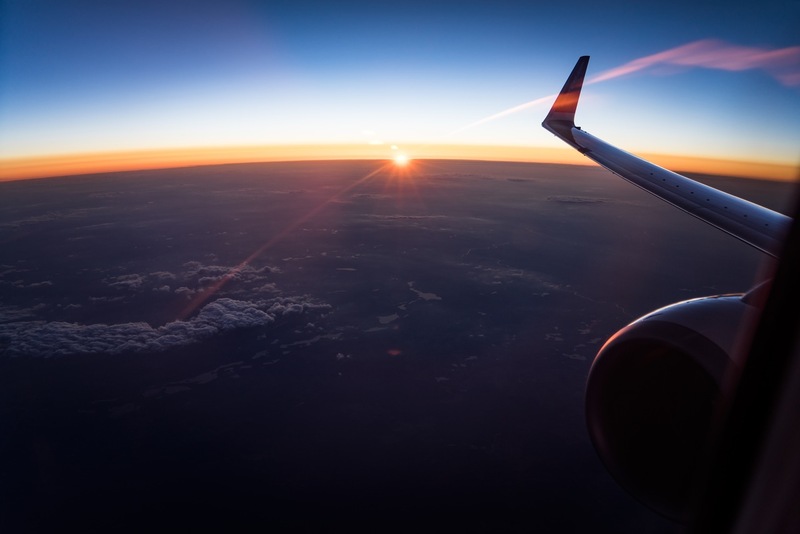 After the excursion and freshening up, the journey continues further south to arrive back in Windhoek in the late afternoon, just as the sun is setting. Upon your arrival in Windhoek you will be transferred to your hotel. NOTE (OPTIONAL EXTENSION): You have the option to extend your safari for an additional night or two at Okonjima, staying at their delightful Luxury Bush Camp. This affords you the opportunity to get a more in-depth insight into the work being done by the AfriCat Foundation as well as getting to see more of cheetah, leopard and other big cats in the wild. This morning you will be transferred from your hotel to the airport to catch your international flight home. Named after the famous explorer Sir Francis Galton, it has a relaxed but efficient style which creates a very welcoming atmosphere. A ten minute drive from the centre of town and perched on the edge of Windhoek, guests staying here will be ensured of peace and tranquillity. The nine guest rooms are all equipped with internet connectivity and satellite television, with other general guest amenities. The communal areas consist of a large lounge, dining room, swimming pool and garden, with a delightful ‘al fresco’ dining area, serving freshly prepared and very tasty meals by their resident chef. Sossus Dune Lodge is built in an environmentally sensitive manner, primarily from wood, canvas and thatch, in an attractive ‘afro–village’ style. Situated within the Namib Naukluft Park, close to the Sesriem Canyon, and providing sweeping vistas of the dunes to the west, guests benefit from being able to reach Sossusvlei before sunrise, or to stay until after sunset. Accommodation units are interlinked by elevated wooden walkways, and consist of 23 well spaced en suite desert chalets, equipped with tea stations and small fridges, with an additional relaxation gazebo. All units offer magnificent open vistas of the surrounding landscapes. Sossus Dune Lodge offers a good base from which to go on guided excursions to Sossusvlei, Sesriem and the surrounding areas, as well as sunset drives and guided walks, to fully unleash the beauty and biological diversity of the desert environment. Amongst the town’s captivating contrasts and old traditions, Gondwana’s Delight is a fresh breeze in the desert. Conveniently located within short walking distance of the ‘Mole’, our modern, uplifting and inviting hotel is the ideal base for your stay. Every effort is made to surprise and delight guests with thoughtful touches and locally inspired reasons to smile. From the easy comfort of our hotel, the warm and welcoming service Gondwana is known for, to the assistance provided by our knowledgable Delight Host for anything from activity bookings to dinner reservations – your stay is always an effortless and memorable experience. Camp Kipwe lies in the heart of Damaraland, ideally located a short drive from the local attractions in the area. The Camp is nestled amongst an outcrop of giant granite boulders, a stone’s throw away from the ephemeral Aba Huab riverbed where desert adapted elephants often traverse. Each comfortable thatched bungalow is simply but tastefully furnished with en-suite open-air bathroom. In the centre of the camp lies a large alfresco dining area, bar, lounge and reception with an inviting fireplace nearby to relax beside in the evenings. A refreshing swimming pool and sunset lookout with lovely views also complement the Camp. Tree Top is a unique and beautiful camp, situated on the private Onguma Game Reserve, bordering on the eastern side of Etosha National Park. It is a small and intimate camp, especially designed for those travellers who would like to truly experience the bush in all its raw splendour. This camp is built on wooden stilts amongst the tree tops with full views over one of the most beautiful watering holes on the Reserve. The camp consists of 4 thatched wooden chalets and a main complex, making the camp ideal for a small group looking for a private getaway. The main complex is completely open towards the front where the waterhole is situated, but there is also the option of letting down canvas sides if the weather is inclement. Guests can relax in the comfortable lounge or in front of the fire place. The kitchen is open plan so guests can watch whilst the chef conjures up wonderful dishes on an open fire. The Boma area steps off from the lounge deck, where guests can relax while watching the animals and birds that frequent the hole throughout the day. The thatched rooms are designed in such a way that the canvas sides can be opened to expose breath-taking view and animals at any time. All rooms have an en-suite bathroom as well as a wonderful private outside shower, and a private deck in front where guests can relax and enjoy exactly the same views as from the main area’s deck.